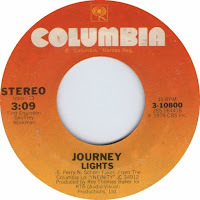 In Medias Res: Songs of '78: "Lights"
"Lights" was the final single released off of Journey's wonderful album Infinity, which had already produced two earlier--and, musically speaking, probably better--hit singles in 1978: "Wheel in the Sky" and "Feeling That Way." "Wheel," in particular, was a much bigger hit that "Lights"; I can't think of when I first heard this particular song, though it probably wasn't in 1978 (I didn't listen to the whole album through until years after it was released). But still, I've waited until August, when this single was released 40 years ago, to flag Journey and this album, because "Lights" has become, for me and for so many people, a simply iconic representation of Steve Perry's sound and overall sensibility. It's a song with a deep, driving longing to it, but also a kindness too (Perry astonishing natural alto--a pretty rare voice--was often heavy with emotion, but was never threatening, I think). Originally written about Los Angeles, he and the band realized that making it about their real home base, San Francisco, made the lyrics scan so much better. They were right. What's the Matter with Kris Kobach? Songs of '78: "The Load-Out/Stay"
Songs of '78: "Don't Look Back"